Patterns for e-business are a group of proven, reusable assets that can be used to increase the speed of developing and deploying e-business applications. 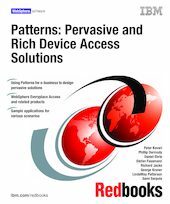 This IBM Redbooks publication focuses on the architecture and implementation of pervasive solutions using currently available IBM products. Part 1 uses the Patterns for e-business to describe the Application and Runtime patterns applicable to pervasive solutions. IBM product mappings are applied to these patterns. Part 2 describes the technologies key to building pervasive solutions. It also describes the IBM development tools for building these solutions. Part 3 consists of eight pervasive scenarios. Each scenario implements an IBM product mapping, and provides design, development, and runtime guidelines for building these scenarios.